Upgrade to a custom built aluminum driveshaft from Street or Track! Reduce rotating weight by up to 8lbs over stock. Rev faster due to less weight. 1310 U-joints included both ends as standard. 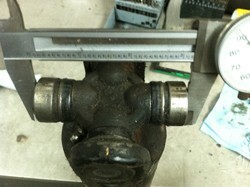 1310 U-joints measure 3 7/32" cap to cap and have a 1 1/16" cap diameter. 1330 U-joints measure 3 5/8" cap to cap and have a 1 1/16" cap diameter. 1350 available at additional cost. 1350 U-joints measure 3 5/8" cap to cap and have a 1 3/16" diameter. 1310-1330 or 1310-1350 conversion u-joints available at additional cost. Reduced harmonic vibration associated with OEM driveshafts. Every order custom built and balanced to your exact dimensions! The most important dimension in ordering a drive shaft is the length. This length is expressed as the distance between the centers of the front and rear u-joints. Take the slip yoke that the driveshaft will be assembled to and insert it all the way into the tailshaft housing of the transmission. Now pull it out 3/4" to 1". This will be the free play that all driveshafts need when the suspension moves through its full range of travel. Carefully measure the distance between the centers of the front and rear u-joints. 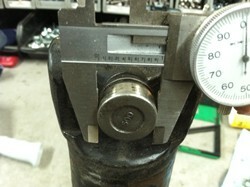 Double check the 3/4" to 1" free play in the slip yoke and measure again. Measure twice, order once! This is the length for your new aluminum drive shaft. We need to know the cap diameter and the cap to cap distance required on EACH end of the new shaft. If you currently have a shaft that fits, measure it. If not, measure the pinion and yoke where the caps would install. Once you have your dimensions use the list above to select which type you need and select from the drop down list below. Please select length required: 35" 35-1/2" 36" 36-1/2" 37" 37-1/2" 38" 38-1/2" 39" 39-1/2" 40" 40-1/2" 41" 41-1/2" 42" 42-1/2" 43" 43-1/2" 44" 44-1/2" 45" 45-1/2" 46" 46-1/2" 47" 47-1/2" 48" 48-1/2" 49" 49-1/2" 50" 50-1/2" 51" 51-1/2" 52" 52-1/2" 53" 53-1/2" 54" 54-1/2" 55" 55-1/2" 56" 56-1/2" 57" 57-1/2" 58" 58-1/2" 59" 59-1/2" 60"
Excellent product and great value for the price. Worked perfect with no vibration when we installed it on the new T5 conversion in our 66 Mustang.